Butrint is an archaeological site that provides valuable evidence of ancient and medieval civilizations on the territory of modern Albania. The site, on a hill next to a lake connecting to the sea by a canal, has been inhabited since prehistoric times. A Greek colony was founded there in the late 7th century BC, when the city (called Buthros) was surrounded by fortifications. Roman occupation prompted the development of the city and, during the Christian era, it became the seat of a bishopric. Many religious structures were built by the Christians. From the time the Slavs came to the Balkans (7th century) until the founding of the Epirus despotate (after the taking of Constantinople by the Crusades in 1204), the city underwent great trials. The city's last era of prosperity was under Byzantine administration (Epirus). After a short period of occupation by the Venetians (late 14th century), the city under Ottoman administration was threatened by the marshes that formed around the lake, and was abandoned by the population. Butrint lies just across the Straits of Corfu from my previous destination, the Old Town of Corfu. It’s an easy trip out there from the Ionian Island: daily hydrofoils and ferries ply the route to the Albanian resort of Sarande, from where an hourly local bus heads out to Butrint 30km south. The WHS covers an archeological site that spans a long period, with mainly Greek, Roman and Byzantine remains. It also seems to have been renominated in 1999 as a cultural landscape, although UNESCO does not list it as such. During the high season the site can be crowded with daytrippers from Corfu, but fortunately I arrived early in the season. After paying the 700 lek entrance fee (5 EUR), I headed out on the forest path that connects the ruins. This shady environment was the first surprise of my visit: it’s a pleasure just to walk here, and I heard birds singing all the time. The natural area of Butrint also is awarded Ramsar wetland status. The wetness of the area clearly shows at the first major archeological group: the former Greek sanctuary and theatre can only be entered via a boardwalk, and I noticed frogs in the Roman baths. 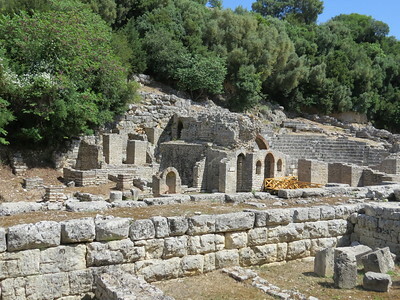 Here’s where the origins of the site are, Butrint was founded as a sanctuary to Asklepios the Greek god of medicine. Visitors even freed some of their slaves to persuade the gods to help them – and they testified to that by carving inscriptions into the theatre’s walls. These can still be seen in situ. In hindsight this area probably was the most interesting part of the circuit. I had the site mostly to myself. I passed a series of Ancient Greek, Roman and Byzantine constructions, much like those at other classical sites that I have visited around the Mediterranean. A lot of mosaics have been discovered here too, but the Albanian authorities have covered them from the elements by plastic sheets and sand or pebbles. This is a pity as the mosaics would add something extra to this site, but the wet surroundings just seem to prevent this. The path eventually turns uphill, towards what once was the Acropolis. 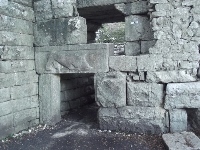 You enter that area via the ‘Lion’s Gate’, a stone structure with a bas relief of a lion devouring the head of a bull. The lion relief was not part of the original wall or gate, but was found elsewhere in Butrint and may date to the 6th century BC. The circuit ends at a building from the Venetian period, which now houses the slightly disappointing site museum. The WHS of Butrint was extended in 1999 to include the natural surroundings such as a range of hills to the north, the Butrint plain, Lake Bufit, and part of Lake Butrint. At the same time it was turned from 'just' a site into a cultural landscape. I think including its natural features was a good decision, as they are such a prominent part of a visit here. There are fine views on the surrounding lakes (Butrint lies on a peninsula) from the path across the site, and there are benches to sit on and enjoy the landscape. I found it a very peaceful site, I saw no traces of the turbulent times in the late 1990s when Butrint suffered from looting due to the civil disturbances in Albania. This september my friends and I were on vacation in Albania.We stayed in Ksamil for the first part of the jorney.The National park of Butrint is only a few minutes by car from there.I like the place.When you are walking in the park you can go through differnt Ages and see remains from Helenistic, Roman, Byzantine, Venetian and Ottoman cultures and civilizations. I reached Sarande by bus along a modern highway from Tirane, about 80% complete. From Sarande a local bus took me to the gates of the site. In exchange for the 700 lek entry fee I received a descriptive brochure with a map of the site, in English. There were other signposts around the site attempting to explain which parts of the excavations belong to which period of occupation. There was no compulsion to join a tour or hire a guide. Even without the archaeological site the scenery of the sea separated from the lake by a narrow strip of land would be worth visiting. From Sarande I left by hydrofoil ferry for Corfu, another WHS. This is certainly an awesome site. We went on a tour whilst on a holiday in Corfu, to Sarande in Albania. The place is full of antiquities! Unfortunately as others have noted, the place is collapsing into the nearby lake. Infact the main temple and other parts of Butrint are already underwater. The area is a treasure in itself with remains of Greek, Romans, Byzantines, Venetians and the Turks. A definite visit for history enthusiasts! We visited Butrint in mid August 2005 on a day trip from Parga in Greece. Our gude was extremely knowledgeable and genuinely helped us understand the site. This was important because the "guidebook" (effectively an expensive pamphlet at 6E) was probaly the most useless of it's type I have encountered! The main dissapointment was that we were not able to explore, and followed a set route, which although benefiting from the guide, meant we did not see all that we would have liked. Also dissapointing was that the mosaics were all (rightly) covered with sand for protection, but there was only a very poor diagram - a photo display would have been so much better. The other point to note is that Butrint is in a marsh, and the attendent mosquitoes are very active. We all got severely bitten, despite pleanty (we thought) insect repellent. Butrinti is an extensive site covering most periods of Albanian and Balkan history - with the merciful exception of the 20th century. Many of the ruins are very striking but, because one is looking at an early Christian basilica one moment and maybe remains of fortifications built by an early 19th century local warlord the next, mental orientation can be quite difficult at times and a guide is particularly useful. If travelling independently, an excellently-produced guide-book is available but it may not be on sale at the site - this is Albania, after all - although it should be in the nearby town of Saranda. What is easy to appreciate, however, is the glorious siting of Butrinti, almost surrounded by a lake and against a mountain backdrop. All visitors to Corfu should consider a day-trip to Butrinti - easily arranged and with minimal formalities. Not only is this an opportunity of seeing one of the great Balkan achaeological sites, it also allows a brief glimpse of a fascinating country which has come a long way in the last decade but still has a hard road ahead of it. Butrint lies in the far south of Albania, and can best be reached from the town of Sarande. There are hourly public buses. Asklepieion: "By the 4th century BC it had grown in importance and included a theatre, a sanctuary dedicated to Asclepius" (Wiki). "Butrint owes its growth and early fame to a sanctuary dedicated to Asclepius, the Greek god of medicine. The sanctuary was located on the south slope of the acropolis. Worshippers came to the sanctuary in order to be healed, leaving symbolic objects and money to the god and his attendant priests. The sanctuary was the making of Butrint and the sacred power of Butrint’s water was revered as long as the town lasted." Founded after Animal Miracle: Legend tells us about an ox that was meant to be sacrificed but escaped, struggled wounded ashore and died on the beach. Of course this was taken as a good sign and so Butrint was founded. It connects nicely with the namecalling too because originally the place was known as Buthrotum meaning "wounded ox". Cultural landscape not recognized: Clearly described as a CL in 1997 extension. Relict.